Many new power plant boilers are commissioned using a temporary steam generator (package boiler) as the heat source for chemically cleaning and passivating the newly installed tubes. The package boiler generates steam which is used to heat the process solutions via a heat exchanger. The solutions are then pumped up to and through the boiler tubes and the solution loses temperature throughout the piping loop. Hotwork can provide an alternative to the lead time, installation expense and transportation of large package boilers and heat exchangers for this function. 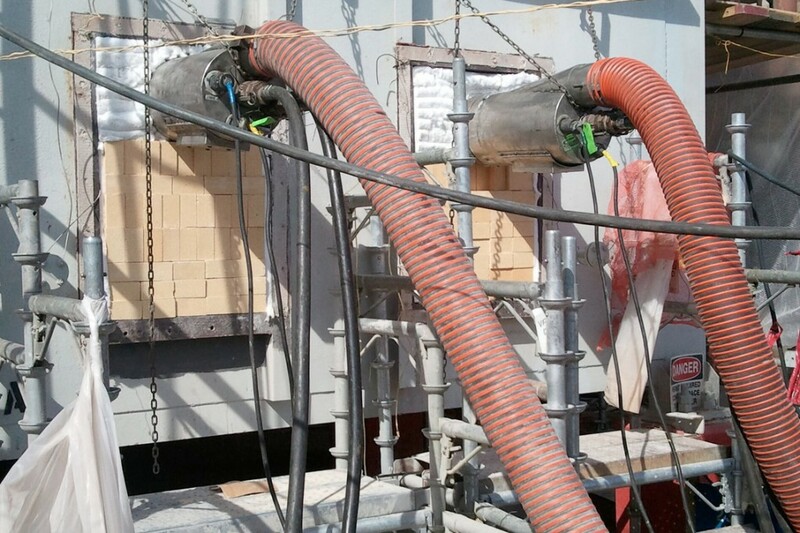 Hotwork’s portable burner system can be used to fire into the firebox and provide the temporary heat source for heating the chemical cleaning solutions. This method has the advantage of controlling the process temperature where the reactions are taking place (in the tubes) versus doing it remotely. After all, the boiler tubes are designed to be heat exchangers. Hotwork has also provided temporary heat solutions for freeze protection during construction and commissioning in cold climates. Once the tubes have been initially charged with fluid, they remain vulnerable to damage from freezing until they are finally placed into continuous service. Hotwork can provide freeze protection heating in order to avoid repeatedly draining and purging the system during commissioning activities. Hotwork can also provide temporary heat for steam blows, pressure tests and other commissioning activities prior to initialization of the main boiler combustion system.